Mecha is our 70s sci-fi mini-comic. The story of a failed revolutionary fighting his alien overlords. That’s what Brian was missing: giant robots! Sorry, did I give away the ending? I was guessing people would have picked up on the giant robot thing from the title. Anyway, this is about twice as big as the usual BJM mini comic and, if this is at all easy to produce, I suggest he go with this format all the time. Much easier to turn the pages and bigger pretty pictures to look at, what’s wrong with that? This is the story of a man who can’t even remember his life before the Martians took over and has been fighting for his life as a gladiator. He eventually gets away with a group of people, spends years fighting Martians and eventually meets the woman of his dreams. Sadly, a happy ending is impossible in these books and things take a turn for the worse. This leaves our hero at a loss for what to do with his life… until he finds one of the old giant robots used at the start of the war with the Martians. I’m starting to just accept the fact that Brian has the ability to put out half a dozen series or so on a regular basis and have them all be intriguing in their own way, but it’s best to remember not to take this sort of thing for granted. Sure, he’s not the artist so he has that going for him, but I’d almost think it would be harder trying to keep the attention of a half dozen artists for the length of a series. Whatever it is he’s doing he should keep it up, as this is yet another winner. Or maybe it turns to crap in the next issue, but the guy has more than earned the benefit of the doubt by now. This is probably the best of the small scale Silber Media line that I’ve sampled to date. The staccato rhythm of the text along the scroll at the bottom of the page which never seems to change is still a little on the bland side, but the story itself is the most engaging one I’ve seen from Mitchell so far, and Hoang’s art is mostly pleasing to the eye. The hook is simple yet strong, about a Martian invasion – and we lost. The remaining humans are part of a struggling resistance movement, and the protagonist attempts to leave the conflict in search of love. Ultimately, he’s drawn back in by the discovery a mech robot that might be utilized to further the resistance to Martian occupation. Hoang’s style is relatively simple line art, but is neat and clear, and high on emotional content. Grade A-. Wow! This book is larger in size than the other two, and I think I know why. It is to showcase how much more I liked it over the other two. Very solid artwork on each page, especially for only being 2.5? squares. Nice detailed work in those spaces. The story is very entertaining and nicely written. A great #1 that covers all of it’s major plot points and gets you ready for what is next to come. I loved it! When it comes time for a publisher to have a template of a well produced and detailed, complete mini-story, Mecha #1 is the one you want. I'm sure all sorts of silly things like "good things come in small packages" have been said about Silber Media, but this one is definitely true of that phrase. It starts after the Martians have landed on Earth, continues with an escaped gladiator, and ends with a love story. Strange combination for a good story, I know. It has a Terminator flavoring to it, with the humans vs. Martians and how their war still continues throughout the issue. The art is black and white line art and makes really good use of the negative space that black creates in a frame. Sometimes it's a little sparse but the story is a simple one and too much detail in the art might ruin the simplicity the author intended. The font is a tiny bit small and could have been a little bigger, but there;s that pesky simplicity thing again. This comic may be a bit hard to find in stores, but easy to find on the internet. http://www.silbermedia.com/mecha. Check it. Writer Brian John Mitchell has some new minis from Silber Media, and a few of them stuck out to me this time around. 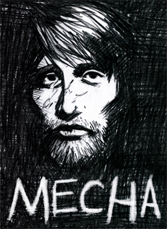 First up is MECHA, which is based on an album by Mitchell’s band, Remora. The story, illustrated by Johnny Hoang, is one of survival and love, as a young man raised on an Earth conquered by Martians makes his escape and ultimately tries to find his humanity. This one is printed a little larger than the normal micro-minis Mitchell puts out, which allows Hoang’s art some space to breathe. Smart move, because it looks pretty good. “Mecha” was written by Brian John Mitchell with art by Johnny Hoang, and it takes place on what seems to be a future eartch, where Martians have invaded and subjugated the human race. The protagonist is a man who was raised as a slave, forced to fight for the amusement of the martians. He escapes one day, and becomes the leader of a resistance movement. Just when you think this story is going to be a war story though, Mitchell takes it to a much more personal place. The resistance leader falls in love with a woman and leaves the battlefield for a somewhat normal life. Unfortaunately for the new couple, things don't work out as planned, but it's not for the reasons you might assume.